There are many islands in Thailand, so many that they can cover all tastes. Pakbia Island, an uninhabited island that gives us everything what you can desire for spent a few hours. It's so small which may be covered with the eye and only takes 10 minutes to cross it from East to West. However, it has many points inaccessible or difficult to access, an high rocky hill, a beautiful small bay closed by a limestone which looks a stone mushroon, a sandbar, two beaches very different each one, starting with the water temperature. All this in no more than a quarter of a square mile at most. Oh, also has an impenetrable jungle. Pakbia Island is aligned perpendicular to another island of similar features, but something larger: its neighbor, Rai Island. Both islands are separated by a narrow channel of 115 meters long. However, the only beach in Koh Rai has a large sand spit that extends towards the North beach of Ko Phak. At low tide, it's possible to go from one island to another without swimming more than 60 meters. The water color is a intense emerald green here. The water entering by the channel is cooler than the very warm that runs along the North beach of Ko Phak. This makes the bath be very nice here, and to do it between two rocky islands, with lush vegetation, separated by a narrow channel is an experience that impacts our senses. 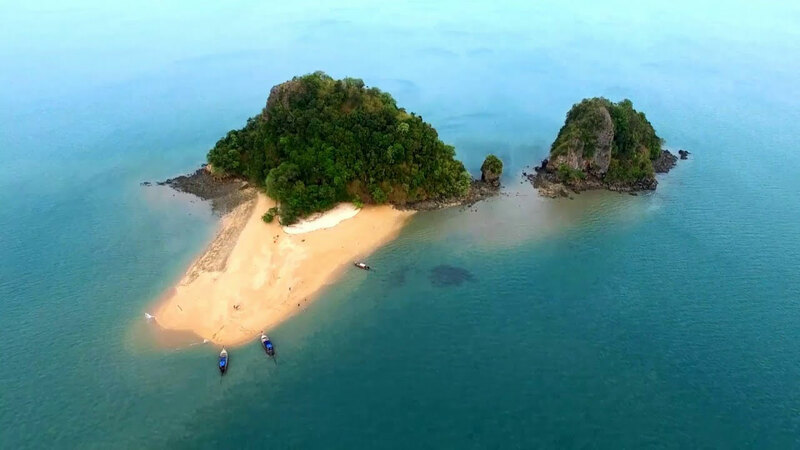 The North beach of Ko Pha is 260 meters long, as much as the whole island by this side, including the resting that connects to a small rock formation west. However it's very narrow, about two or three meters, because an insurmountable cliff drops steeply over that beach. In contrast, in the restinga, the greatest width is about 50 meters even in high tide.